The best pieces of provenance evidence — the most interesting inscriptions, marginalia, and annotations — tell us not only about the volume in our hands (where it has been, who owned it, and so on), they reveal something about the world beyond the book. 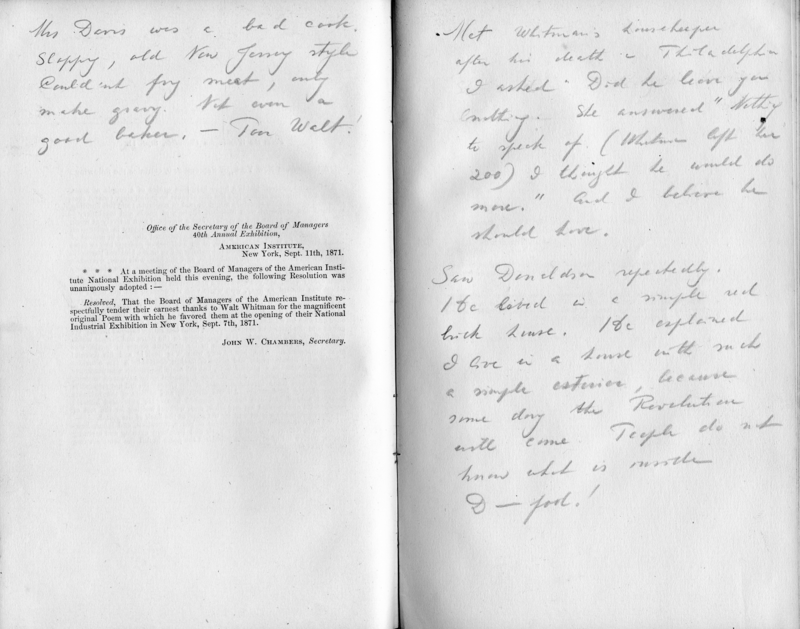 Handwritten indexes, nota benes, and underlining can clue us into what a particular reader took away from a given work. Marginal glosses and textual commentary can reveal much about the history of scholarship and reading. And occasionally, personal notes unrelated to the content of a book can give us great insight into the life and times of the book’s owner(s) and those they knew. When the book owner in question is a particularly noteworthy historical figure, these personal inscriptions and annotations can be of special interest to the historian. One book that I like to trot out now and again as an example of this is our first edition copy of The Great Gatsby, inscribed by F. Scott Fitzgerald. The author’s note in that book reveals something about his creative process, and gives us insight into the character of Jay Gatsby. This example is limited, however, because the note is terse, related wholly to the book at hand. 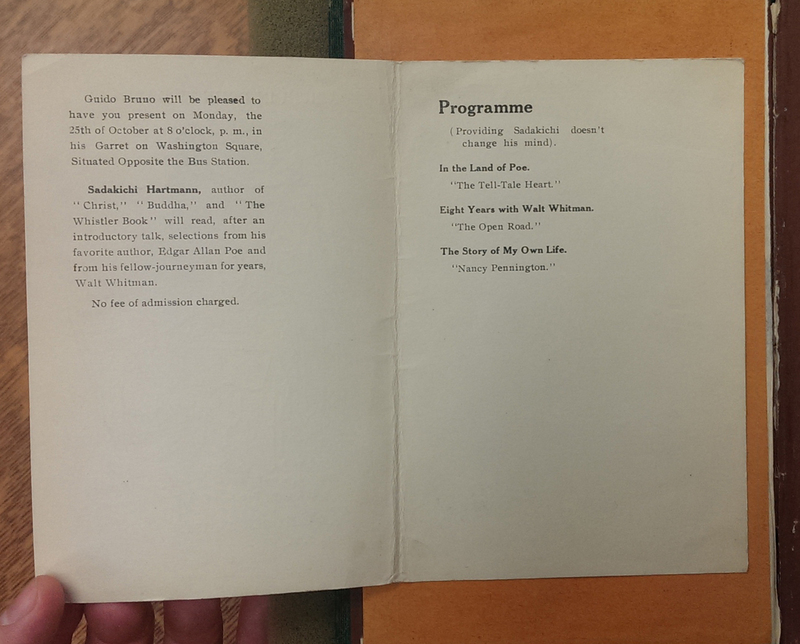 Provenance Project volunteer Meg Hughey recently discovered another book in our collections that illustrates this point even better: A copy of Walt Whitman’s 1871 poem After All, Not to Create Only owned by Whitman’s friend Sadakichi Hartmann. 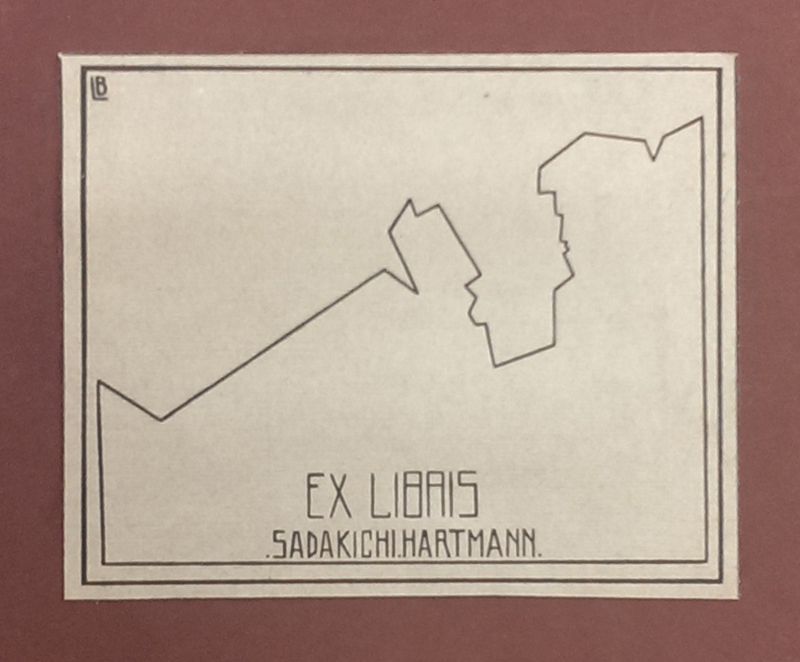 (Carl) Sadakichi Hartmann was a man with an eclectic background. Born in Japan in 1867 to a German merchant father and a Japanese mother, Hartmann was schooled in Germany before being disowned by his father at the age of 14 and sent to live in the United States. While making his way in the States as a young man, Hartmann taught himself to appreciate art and poetry, and before too long had become acquaintances with a number of notable contemporary authors and artists, including Walt Whitman (already near the end of his life when the young Hartmann came to know him). 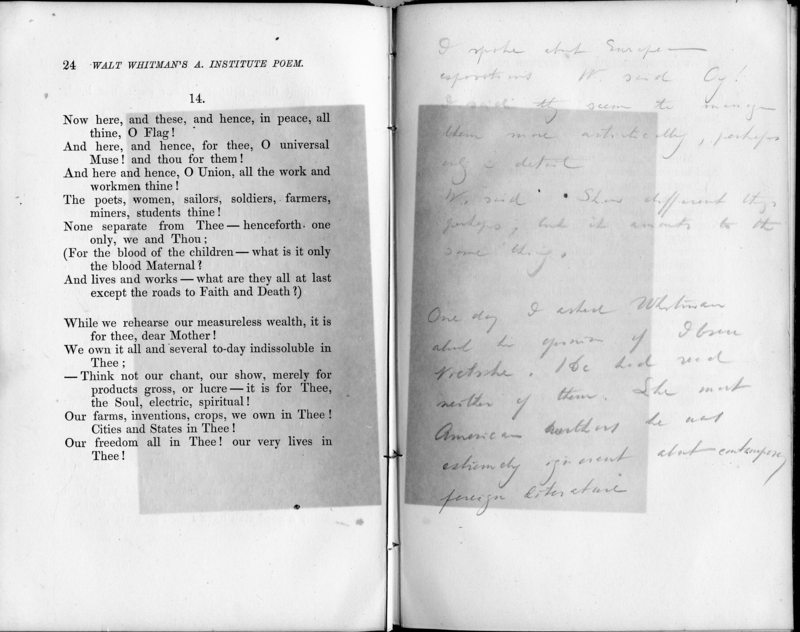 Hartmann’s copy of Whitman’s poem After All, Not to Create Only bears some evidence of his time in Greenwich Village. Pasted in the front is a programme, printed by Guido Bruno, announcing a poetry reading by Hartmann on October 25, 1915. The illustration on the first page (by Hartmann’s common-law wife, Lillian Bonham) shows Hartmann frying eggs with a seated Walt Whitman. 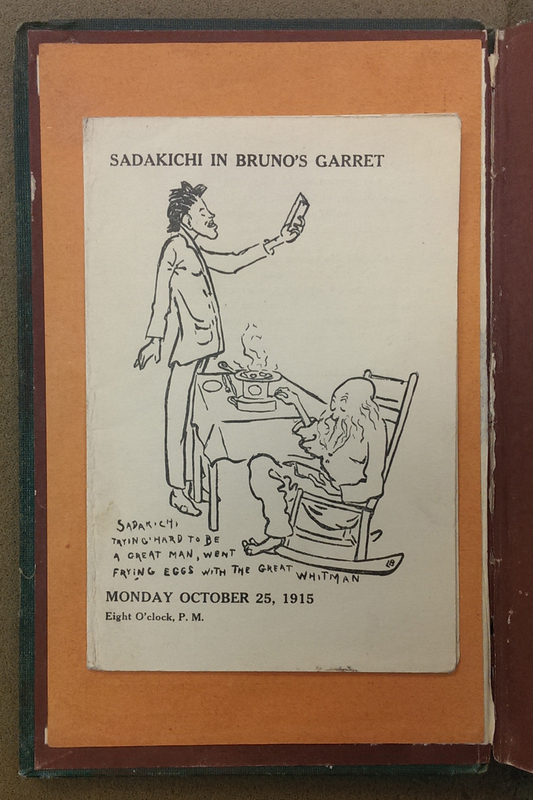 The free event took place at Bruno’s Garret on Washington Square, and featured Hartmann reading some of his favorite poetry (“providing Sadakichi doesn’t change his mind”). Most interesting, however, and unique to the copy in MSU Special Collections, is a series of notes penciled in the last few pages of the thin book. 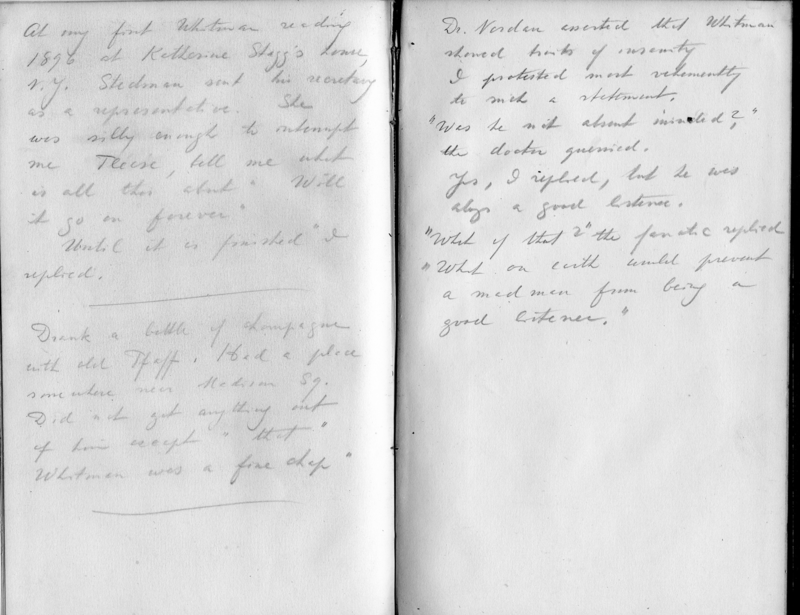 Hartmann appears to have used his copy of Whitman to record anecdotes from his personal life, including several stories of his interactions with Whitman himself. These short episodes reveal much about both poets, and their relationship. 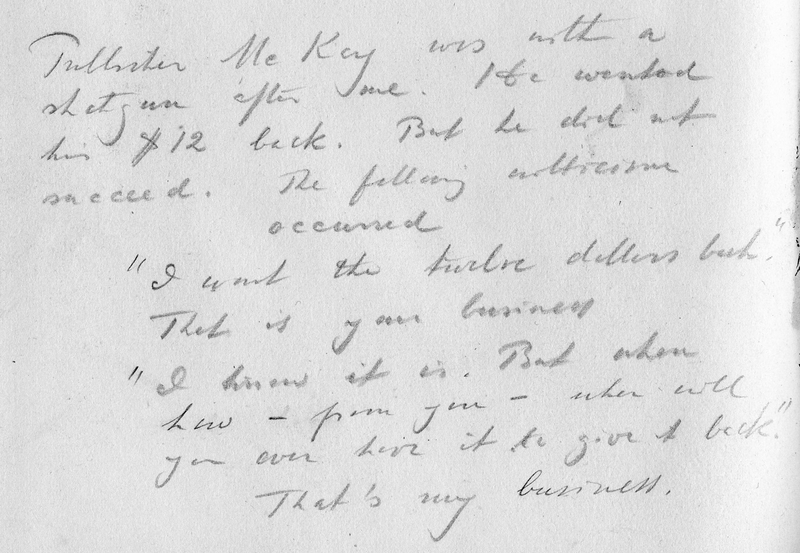 Another note critical of the poet recounts Hartmann’s chance meeting with Whitman’s housekeeper in Philadelphia. 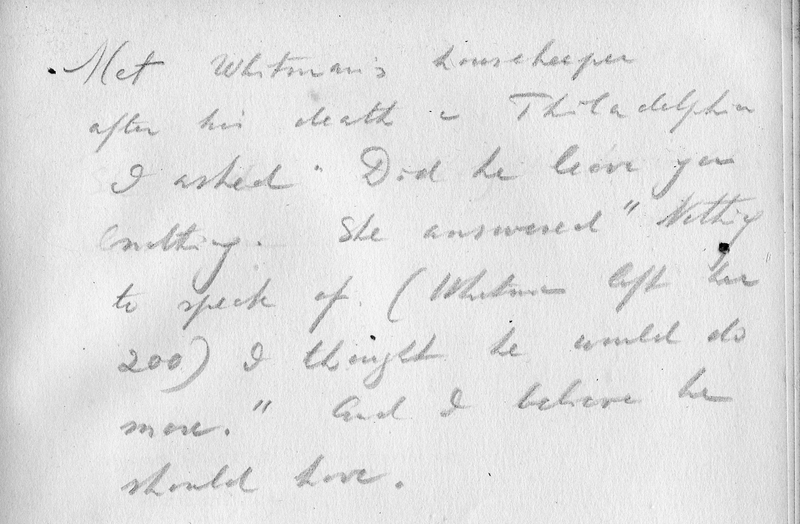 When asked if Whitman had left the woman anything upon his death, she is said to have replied “Nothing to speak of… I thought he would do more.” Hartmann agrees, although he does note that Whitman left his housekeeper $200, at least (not a small sum of money in 1892). 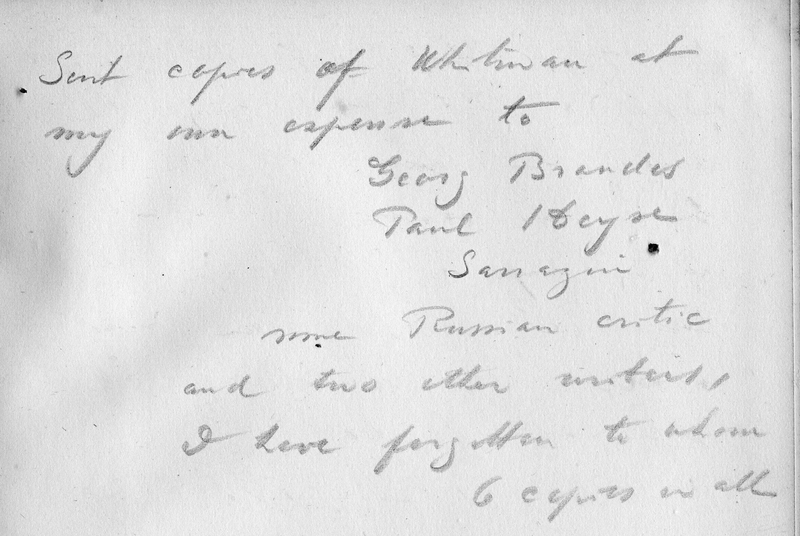 Not all of the notes about Whitman are critical, however. 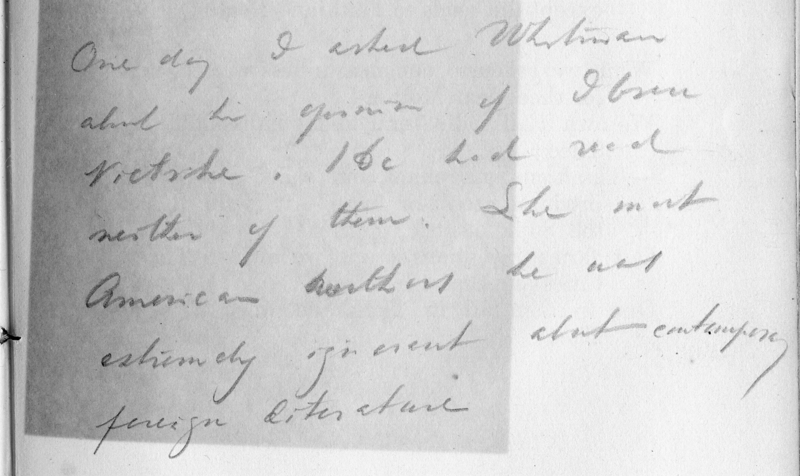 Hartmann was clearly fond of Whitman, and he mentions readings he did of the elder poet’s work, positive conversations about Whitman with others, and one occasion where he came to Whitman’s defense against a doctor’s charges of insanity. “Dr. 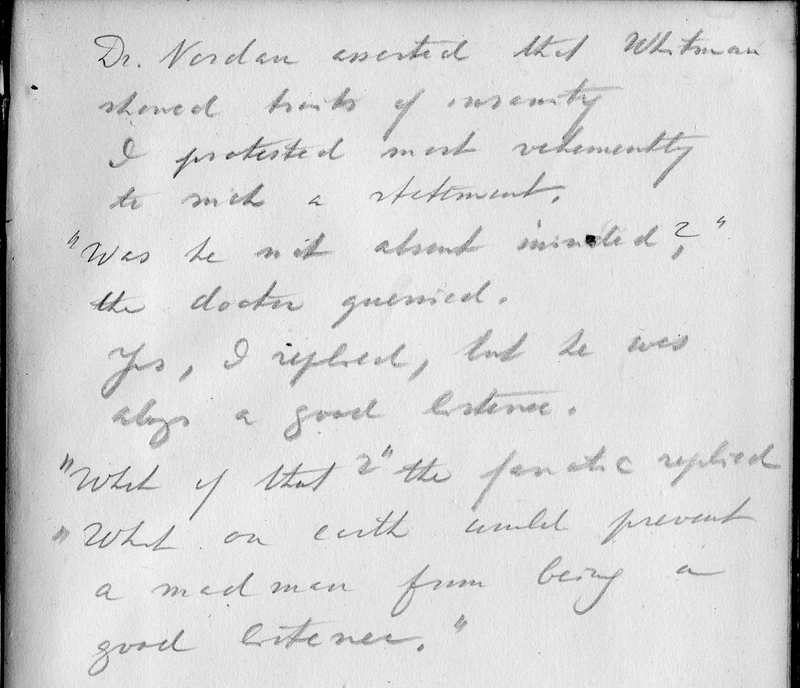 Nordan asserted that Whitman showed traits of insanity,” Hartmann recalls. “I protested most vehemently to such a statement.” When the doctor asks if Whitman was absesnt-minded, Hartmann replies “Yes, but he was always a good listener.” The doctor (“the fanatic,” in Hartmann’s words) shoots back: “What of that? What on earth would prevent a mad man from being a good listener?” Hartmann remains silent on this point. The anecdotes, however, aren’t all about Whitman. Hartmann, as a regular in the Greenwich Village Bohemian scene and as an established author in his own right, was connected to a number of other noteworthy individuals. 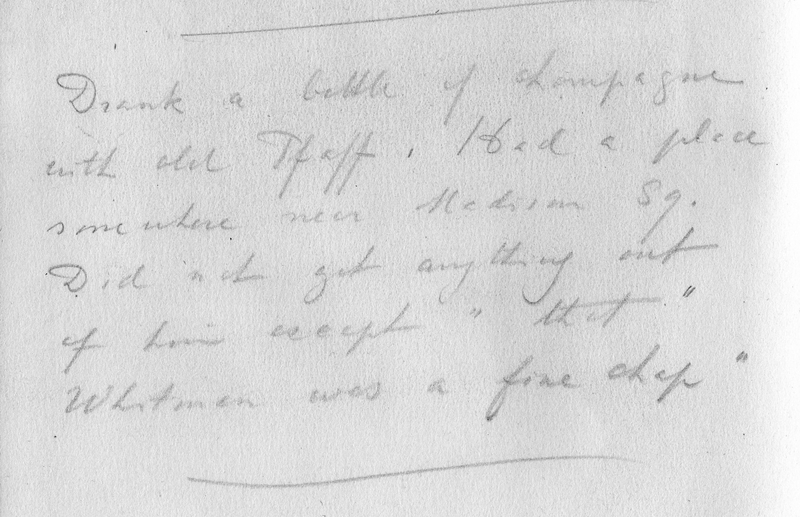 He drops several names in his notes — in one he recounts drinking a bottle of champagne with “old Pfaff,” the proprietor of a popular Manhattan beer cellar, the two reminiscing about Whitman. 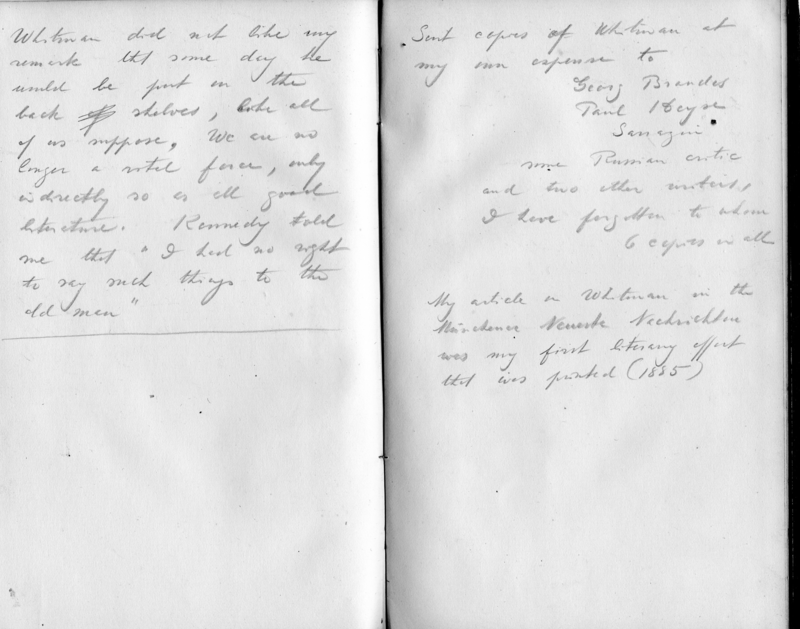 One of Hartmann’s longest notes tells of an early 1890s visit to the home of W.D. Howells, a well known author, editor, and critic of the time. Hartmann, who didn’t really come into his own as a writer until later that decade, was apparently hard up for money at the time of his visit. He showed up at Howells’ in the morning begging for five dollars, which the old man grudgingly handed over. Hartmann promised to repay the loan the next time he came, cynically noting that “at that time I still believed in the possibility of such things,” but never visited Howells at his home again. In true Bohemian fashion, Sadakichi Hartmann never quite got out of his dire financial straits, despite his later success as a poet and literary critic. He eventually moved to California, living and working in Hollywood (and even making a cameo on Douglas Fairbanks’ 1924 film The Thief of Bagdad). In his later years, out of work and in deteriorating health, he moved in with one of his daughters in the California desert. Hartmann eventually died in 1944, at the age of 77. The Special Collections & Archives department of the University of California, Riverside holds a substantial collection of Hartmann’s papers. It is rare to find his papers and remnants of his personal library “in the wild,” so to speak, and MSU is lucky to have his annotated copy of this Whitman poem. The handwritten remembrances and anecdotes in the back typify the personal connection that many individuals have with their books, but Hartmann’s notes are peculiarly exceptional due to their uniqueness and association value. 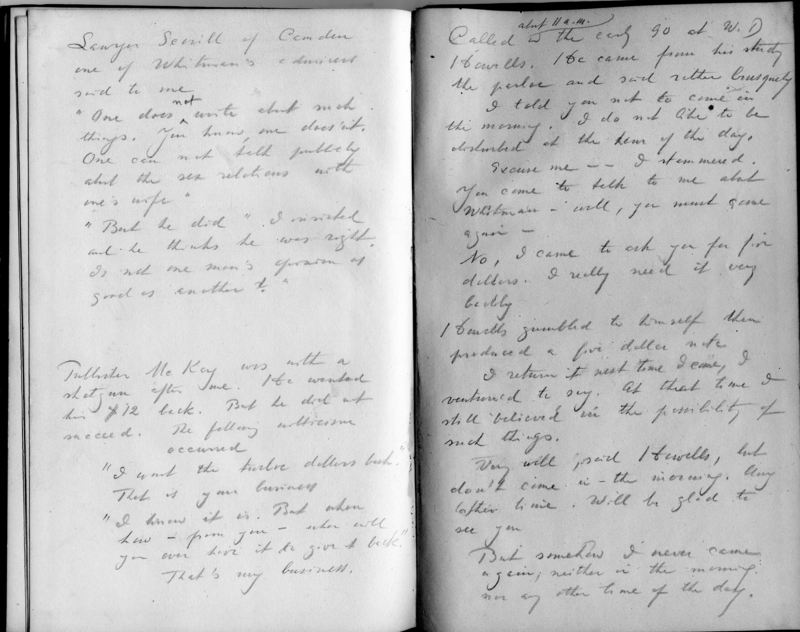 Scans of all of the notes are below, with transcriptions. I have cleaned up Hartmann’s punctuation slightly for readability, and included [in brackets] my assumptions about missing words affecting the meaning of certain sentences. As with anything, though, some passages are up for interpretation. Click on the images for full-sized versions. Mrs. Davis was a bad cook. Sloppy, old New Jersey style. good baker. – Pam Walt! after his death in Philadelphia. I have forgotten to whom. “What of that?” the fanatic replied. things. You know, one doesn’t. “and he thinks he was right. Called about 11 a.m. in the early 90[s] at W.D. Howells. produced a five dollar note. nor any other time of the day.